If you’re considering doing business in Thailand, you are opening yourself up to a world of exciting opportunities. There are many benefits of doing business in Thailand, however, being aware of the Thailand culture and business marketplace will ensure that everything runs smoothly and that you will have the best possible experience in your business operations. Thailand isn’t known as the “land of smiles” for nothing! The population is friendly and welcoming to those who bring their businesses to its exotic shores. Lying between Myanmar, Laos and Cambodia, Thailand has a unique cultural mix, with Chinese traditions and Indian influences blending with uniquely Thai elements. The geography of the country is exceptionally diverse, with a mountainous northern region and tropical sandy beaches to the south. There are four regions of Thailand, each with its own geographic and cultural features. The north is densely forested and mountainous with a culture that takes its influence from Burmese culture. The northeastern region, also called Isan, is primarily Lao-speaking and has a strongly agricultural society. The south of the country is home to tourism thanks to its tropical climate and pristine beaches. Fishing also takes place here. Meanwhile, the center of the country is home to Bangkok, the capital, and is the economic heart of the nation. This region is especially known for its fertile rice fields and it is also the densest populated area of the country. Overall around 70 million people live in Thailand, with around 2 thirds being from ethnic Thai groups and the rest being Chinese, Vietnamese, Mein, Hmong and Khmer. Buddhism has had a strong influence on the population although Hinduism has also contributed to the local culture, with strong links with India in customs, literature and art. Thai is widely understood and spoken, even among different ethnic groups, and Thai script is also generally used. Despite Thai being the national language, in each ethnic group, home languages are also widely spoken, especially in informal situations. Around 95% of people in Thailand are Buddhists, and the values and beliefs of this religion pervade daily life. The Thai population is well-known for its non-confrontational attitude and their excellent self-control. Anger and lying are almost unheard of and public displays of emotion are negatively viewed. Even when feeling upset or frustrated, it’s important to the Thai people to stay friendly and positive, with a smile and a sense of humor. Older people and those in high social positions are strongly respected, and people in prestigious public roles are revered. The family is also very important, and extended family groups living in a single property is very common. Children tend to maintain close ties with their parents even after growing up and becoming independent. While Thailand’s society is traditionally dominated by men, that doesn’t mean that women aren’t respected. In fact, recent legislation and laws have given women in Thailand increased freedom and this has allowed them to move into a wide range of professions including medicine, business and politics. Equal rights and respect for women is a key element of today’s Thai values and law. Thailand is currently the second biggest market in the Association of Southeast Asian Nations (ASEAN), accounting for 17% of the total GDP of ASEAN. The UK is one of Thailand’s leading European investors with a strong presence in industries as diverse as banking and retail. Some of the biggest British investments in the country include Prudential, Triumph Motorcycles, Standard Chartered, HSBC and Tesco. · Thailand is also a useful hub for business opportunities in the Greater Mekong sub-region. This includes south China, Burma, Cambodia and Laos. Which Goods Are Most Commonly Exported To Thailand? When doing business in Thailand, there are a number of important elements of business etiquette. Here, we look at some of the vital things you need to know. Greetings – the wai greeting is traditional in Thailand. You hold your hands raised in a praying position with your head slightly bowed. The higher your raise your hands and the further you bow your head, the more respect you show to the other person. Business cards – in the west, many people treat business cards casually. However, in Thailand, respect is shown to business cards since they are seen as an extension of whoever offers them. Always hand over your business card using both hands. Hold it with the side in the Thai language upwards and with the characters facing towards the recipient. When receiving a business card, accept it using both hands and take the time to look at it. You should say something positive, whether about the design or the office location. Communicating with others – it is very important to be courteous and polite without any rudeness, inconsideration or criticism. Be aware that if someone feels awkward talking about a particular topic they may smile or laugh. This is a good sign to change topics. Also, if you’re feeling awkward about a subject, laughing or smiling will encourage a subject change. Forging strong relationships are very important when doing business in Thailand. You need to work hard to engage your connections and be physically present – Skyping and phone calls are not considered to be sufficient. Building relationships are best done by taking potential business associates out for a meal or drinks to get to know them better. In Thailand, a personal connection must be made before getting down to business. If you’re attending a business dinner or lunch, don’t raise business topics until someone else has mentioned them. When conducting a business meeting, you should confirm that you will be attending the day before and then show up at the correct time. Dress code has a key importance in Thailand. Dress in a sophisticated yet conservative manner. If you are male, a tie and dark suit will be ideal, whereas, for women, a dress, skirt and blouse or a trouser suit will be perfect. The only exception is if the meeting is taking place in a casual setting in which case wearing jeans and a blouse or shirt will be fine. Giving gifts when doing business in Thailand is a key part of the experience. Although it is usually less formal when giving gifts in Thailand than in other parts of southeast Asia, it is still important to follow the correct protocol. It is usually advised to offer a gift that comes from your home country, and gifts which can be shared like snacks, sweets or fruits are an especially good choice since this allows all of the attendees at the meeting to receive some of the gifts. Small items like pens and books are also quite appropriate. When offering and receiving a gift, only use the right hand and perform the wai gesture. Avoid opening the gift in front of the person who has given it. 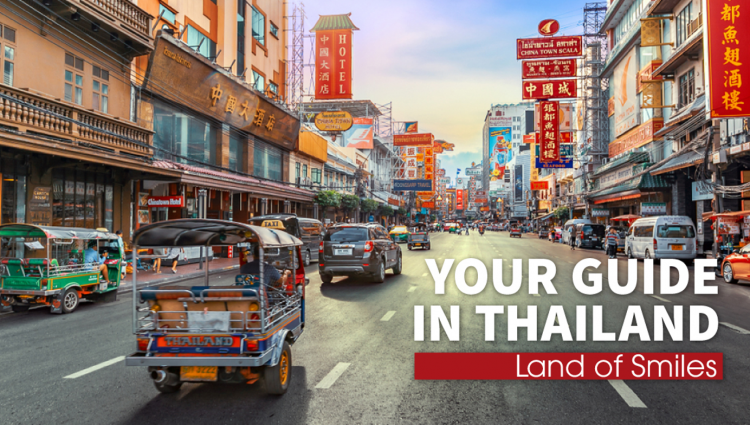 If you’re considering doing business in Thailand, it couldn’t be more important to localize all your marketing materials, website and messages to the Thai language and culture. Even products must sometimes be tailored in order to fit in with the Thailand culture. Choosing a provider of localization services that you can depend upon to do the job to the very highest standards and who can ensure that there will be no unintentional mistakes, misunderstandings or even accidental offenses caused by your content or materials is essential. SEAtongue has over a decade of experience in translating and localizing Thai languages, so you can be completely confident when using our services that even the most subtle nuances in your content and materials will be properly conveyed. When you choose SEAtongue, your business will have the best possible chance of reaching the widest target Thai audience, and you can rest assured that everything you produce will not only be linguistically but also culturally appropriate, giving your company an excellent chance of success in its field.